On 26 March, those who passed through Walthamstow town square in east London came across a very incongruous sight, writes Kay Shipway. 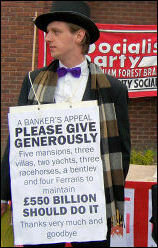 Sack the bankers not the workers! NUT members at Park College, part of Sussex Downs college in Eastbourne, struck on 24 March over proposed changes to their contracts that would downgrade their positions, writes Phil Clarke, Lewes, Eastbourne and Wealden NUT Secretary, personal capacity. 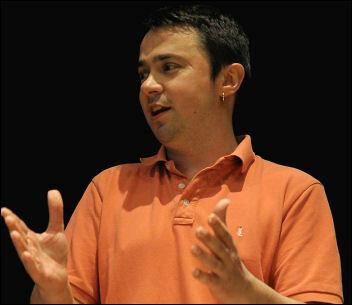 ON SUNDAY 22 March, Mattias Bernhardsson, who is a city councillor for Rättvisepartiet Socialisterna (RS - CWI, Sweden) was the victim of a brutal, planned assault by a group of Nazis, writes socialisterna.org, (CWI, Sweden). 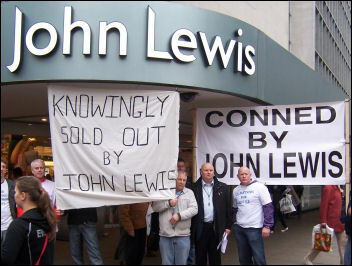 *The right to a decent job for all. *We won't pay for the bosses' crisis! Most scientists now agree that climate change is a very real and immediate danger -temperatures are rising, ice caps are melting and precipitation levels are changing, writes Sarah Wrack. 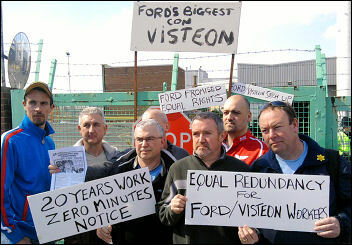 Visteon workers in Belfast have started an occupation of the former Ford car parts factory. 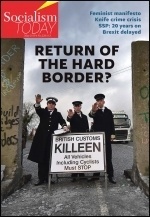 Administrators KPMG have only offered the 200-plus workers paltry statutory redundancy payments, writes John Maguire, Unite convenor spoke to The Socialist from the occupation:. 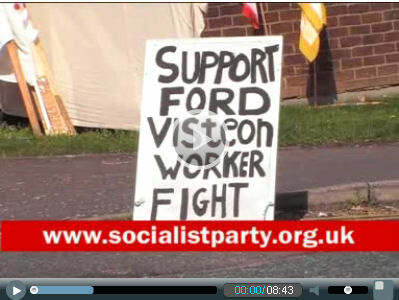 Report from Socialist Party members on the Basildon Visteon pickets. 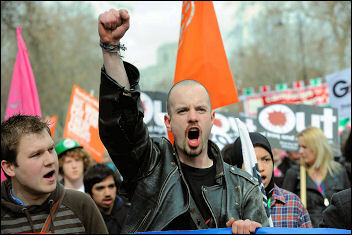 Youth march for jobs: This is only the beginning! 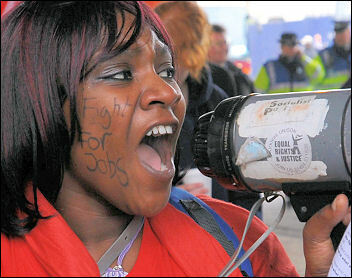 The G20 meeting, hosted by Gordon Brown, in London was met with an outpouring of anger. 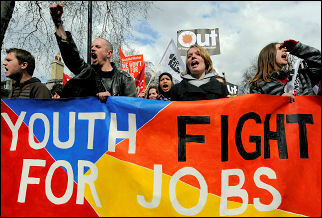 However, of all the many protests against the summit, the 'youth march for jobs' on 2 April stood out a mile. The ghastly slaughter of Tamils in Sri Lanka continues daily and an official 'end' to the war will not mean an end to this nightmare, writes Elizabeth Clarke, Committee for a Workers' International. What kind of a work/life balance is there for any teacher working a 52-hour week? More like all work/no life! Linda Taaffe writes. IF YOU judged the atmosphere on student campuses by the policy that got passed at National Union of Students (NUS) conference, you wouldn't have known that there have been occupations and protests against the Israeli invasion of Gaza or that many universities are facing savage spending cuts, writes Iain Dalton, Bangor University Socialist Students. While over 100 journalists from local newspapers under threat gathered inside Manchester town hall on a Friday night to discuss the way forward, one in every three of Stockport's black cab drivers circled the building in a show of support, writes Hugh Caffrey, Manchester. 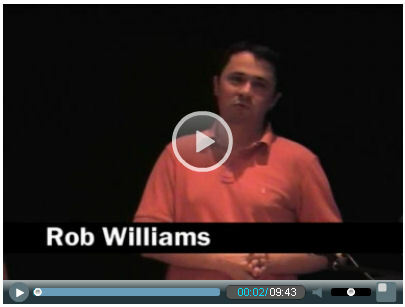 No cuts to further education in Wales! On 1 April, around five hundred students, lecturers and other further education (FE) college staff from across Wales protested and lobbied Welsh Assembly members over threatened redundancies and cuts to funding, pay and conditions, writes Alec Thraves. Following a four-month campaign by local communities and the opportunist intervention of local politicians of all parties, Wirral council's library closure programme has been suspended, writes Dave Lunn, Wirral Against the Cuts (WAC) steering committee, personal capacity. 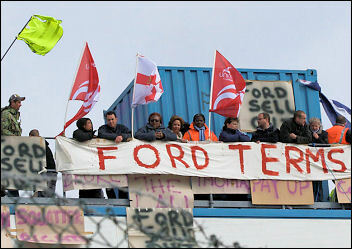 Rail union TSSA members gathered to protest at 160 redundancies outside the East Midlands Trains (EMT) HQ in Derby on 31 March. 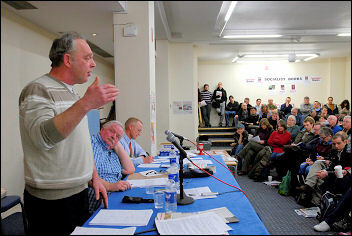 They had a joint meeting with RMT the same evening, writes Graham Lewis, Long Eaton trades council. ON 30 March, it felt as if the city of Chennai waited with intense expectation as the famous writer, Arundhati Roy, was due to deliver a speech in a public meeting condemning the war in Sri Lanka, writes Venkat Narasimham, New Socialist Alternative (CWI, India). 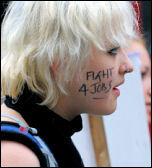 Youth Fight for Jobs: What next to build the campaign? Support for 'Youth Fight for Jobs' (YFJ) continues to grow. John McDonnell MP has now given his support. The national launch conference of YFJ, on Saturday 9 May at University College London, is the next big event for this important campaign. 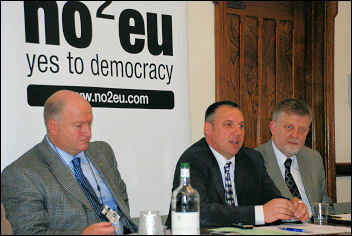 The Socialist Party is backing the No2EU-Yes to Democracy coalition in June's European elections. The European Union's directives and rulings, enthusiastically implemented by the New Labour government, are linked to the avalanche of job losses, wage cuts and continued privatisation that we face, Clive Heemskerk explains. THE RAIL union RMT received a massive democratic mandate from the 41% of members who voted in our recent strike ballot at London Underground, writes Reg Johnstone. PROBATION AREAS in England and Wales face budget cuts of between 13% and 25% over the next three years, writes Andy Ducker, Napo convenor, South Yorkshire branch. 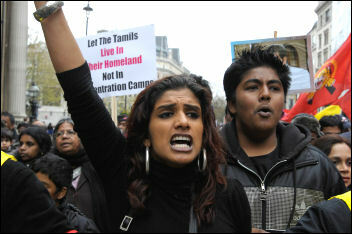 AFTER A week of escalating protests worldwide against the mounting slaughter of Tamils in Sri Lanka, the Rajapakse government announced a two-day halt to the fighting with the separatist Liberation Tigers of Tamil Eelam, writes Elizabeth Clarke, Committee for a Workers' International. PARENTS AT two closure threatened Glasgow schools have taken the bold and courageous step to occupy school buildings, writes Eric Stevenson, CWI, Glasgow. Youth and workers need alternative to pro-market, ethnic-based parties: ON 7 April, thousands of youth stormed and set fire to the parliament building in Kishinau, the capital of Moldova, Europe's poorest country, writes Rob Jones, CWI, Moscow. 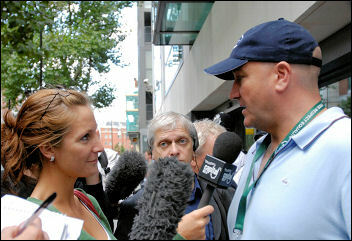 Rugby league: In League with big business? For workers' MPs on a worker's wage: EVERY DAY the press and TV carry stories of cabinet ministers 'on the make' and of MPs mimicking their political superiors' dubious ethics. And, they tell us, it is all perfectly legal, writes Roger Shrives. 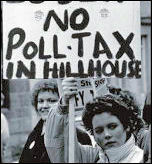 Britain in the 1970s: 30 years ago, the Tory Party leader Margaret Thatcher won a general election which was to prove a sea change in British politics. 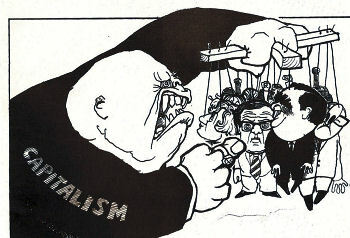 Thatcher promoted a virulent form of free-market capitalism. 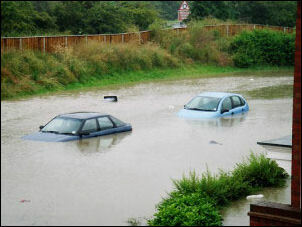 New Labour's environmental ploy: How green are electric cars? DESPERATE TO arrest his precipitous decline in the opinion polls, Gordon Brown has announced an incentive scheme to give people up to £5,000 towards the cost of trading in their old car for an electric one, writes Ken Douglas. G20 Summit death: Independent inquiry into police violence, now! AS REVELATIONS continue, surrounding the policing of the G20 and in particular the tragic killing of Ian Tomlinson at the hands of the police, questions about the role of officers and the specific tactics of 'kettling' (containing demonstrators for hours inside police cordons) increase, writes Greg Maughan. 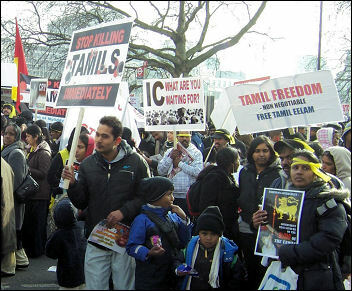 STOP THE Slaughter of Tamils (SST) campaign followed up on the massive national demonstration against the war in Sri Lanka on 11 April with a public meeting in central London, writes Manny Thain. 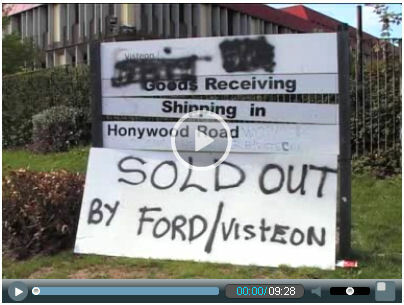 Enfield workers say: "Do a Visteon!" 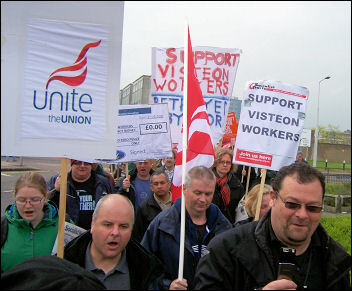 There was a sense of disbelief and outright anger when the outcome of the talks with Visteon management started to filter through to the Enfield site picket lines, writes Mick Cotter. Members of the CWU at the Royal Mail sorting office in Woolwich took industrial action on 31 March and 14 April demanding the full reinstatement of victimised worker Andy Holman, a delivery worker who was sacked just before Christmas last year, writes Paul Callanan. The Welsh Assembly has performed a partial u-turn on Further Education (FE) funding in Wales, coming up with an additional £8.93 million in an announcement on 15 April, writes Ron Job, Unison steward Gorseinon college, personal capacity. Big business parties attack our services: Whether a Labour or a Tory government is elected at the next general election, either will try to make extensive public spending cuts, writes Judy Beishon. In this year’s European elections working-class people have a positive alternative to vote for. A new electoral alliance, No2EU-Yes to Democracy, has been launched to oppose the EU’s big-business agenda. It will also mount a challenge to the divisive, anti-working class, far-right BNP which has, in the past, benefitted from the protest votes in Euro-elections. HANNAH SELL reports on this important initiative. 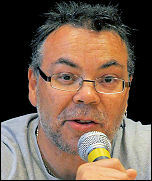 Socialist Party member Rob Williams, the Unite convenor of the Linamar car parts factory (formerly Visteon) in Swansea, was called into the directors' office of the plant on Tuesday 28 April and told that he was being sacked for "irretrievable breakdown of trust". 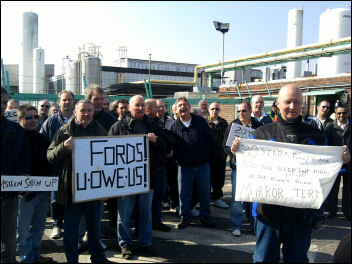 We understand that today's negotiations (29/4/09) between the union and Linamar management have ended. More negotiations have been scheduled for a week's time (Wednesday 6 May). 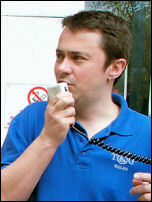 In the meantime Rob remains in his job and as Convenor of the factory. Determined action has forced Linamar to think again. A quarter of newly qualified teachers (NQTs) leave teaching within three years of starting their first job, writes Jim Thomson. 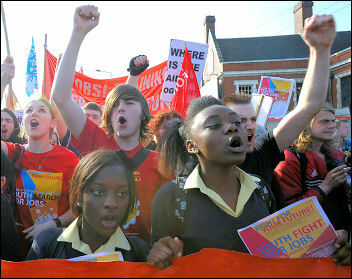 National Union of Teachers conference: Fighting "teaching-on-the-cheap"
Does the 'botch it' budget benefit young people? Alistair Darling's budget, presented on the day that unemployment reached 2.1 million, was posed as a budget of 'job creation', writes Ben Robinson. Olympics site demo 6 May: The London and South East construction branch of Unite have organised a protest at the Olympic construction site in east London on 6 May, writes Keith Gibson, Lindsey Oil Refinary site. On 25 April Basildon town centre was practically taken over by Visteon workers and supporters during a day of action to highlight their fight for justice, writes Eleanor Donne, Basildon Socialist Party. Any Unison members in the NHS who were hoping that this year's health conference would see the start of a fightback against job losses, cuts and privatisation will be hugely disappointed, writes Adrian O'Malley, Unison Health service group executive, personal capacity. 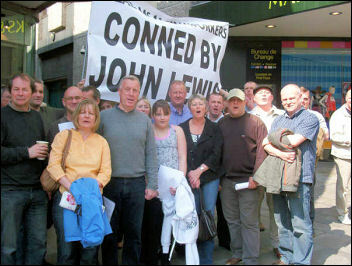 WORKERS AT Stead McAlpin, who were sacked and given just 15 minutes to leave the factory, brought their protest to Newcastle where they picketed John Lewis at its shop inside Eldon Square shopping centre, writes Elaine Brunskill. THE TREASURY'S final report of the Operational Efficiency Programme (OEP) aims to cut government spending by £15 billion, a Land Registry worker writes. Hands off Lewisham Bridge school! PARENTS AND other community campaigners around the Defend Education in Lewisham campaign have been occupying the roof of Lewisham Bridge school in south London since 23 April, writes Chris Newby. THE SRI Lankan Army is pursuing a relentless and bloody battle for the last piece of ground held by the Liberation Tigers of Tamil Eelam (LTTE) in the north-east of the country, writes Elizabeth Clarke. THE SUNDAY Times 'Rich List', the annual survey that estimates the minimum wealth of Britain's 1,000 richest people, is usually an exercise in licking the ruling class' boots, writes Roger Shrives. Today, with world capitalism in its gravest crisis since the 1930s, there is a crying need for a mass political alternative of the working class. 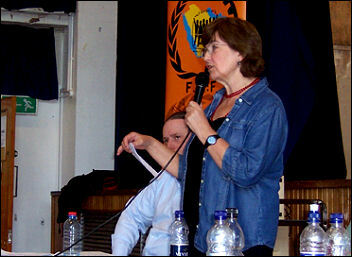 The task of the Committee for a Workers' International (CWI) is to help to create the conditions for the formation of such an international. 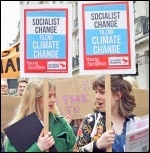 While bankers receive billions of pounds in bailouts, despite being responsible for triggering the economic collapse, hard-working people are faced with a diet of cuts in public services, tax hikes and lay-offs, writes Paul Callanan, Greenwich Socialist Students.